I don’t know if I was more bored or confused by The Timber, but both were a result of poor filmmaking. The screenplay is too smart for its own good, leaving the audience in the dark in a pretentious attempt at forcing them to piece together plot rather than providing exposition. The direction could also be blamed for failing to convey the story adequately amidst the purposefully sparse dialogue, with the editing also easily faulted for the incoherence of the film’s minimal action sequences. This is a film full of technical shortcomings, which destroy the attempt at intelligent storytelling. In a clear attempt at making modern-day parallels, two brothers must take desperate actions to save their home from the grasps of a greedy bank. 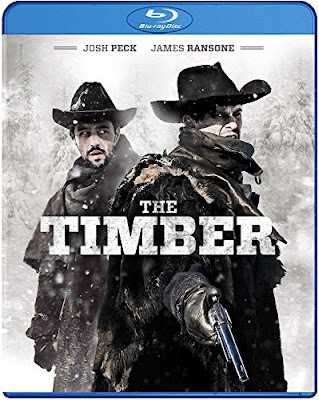 Wyatt (James Ransone) and Samuel (Josh Peck) set out on a mission to collect the bounty on an infamous outlaw who also happens to be their father. Abandoned by him at a young age, neither feels a strong enough connection to adequately raise the stakes on this situation. None of the characters are developed enough within the screenplay for the events to resonate, though this isn’t due to lack of time. Very little happens within the 80-minute running-time, either in terms of action or adequate dialogue. There are aspects of the story which appear to be mirroring Apocalypse Now (and/or Joseph Conrad’s “Heart of Darkness”), with the constant battle against Native Americans leading many to a mental breakdown. It is also a story that is much more about the hunt for a man than the outcome of his discovery. In other words, regardless of the action mixed into the narrative, The Timber is going for an intellectual approach to the material. Unfortunately, the technical ability of the filmmaking doesn’t match the ambition of the narrative. The result is a dull viewing experience which is never quite as smart as it would like you to believe. The Blu-ray release does highlight the admirable visual quality of the film, though it is much more the location of filming which is impressive than the work in the cinematography. High definition does nothing to help the inadequacies of the way that the action is choreographed and shot. Along with behind-the-scenes footage and interviews with the cast, the special features have a commentary track with director Anthony O’Brien. There is also a trailer.